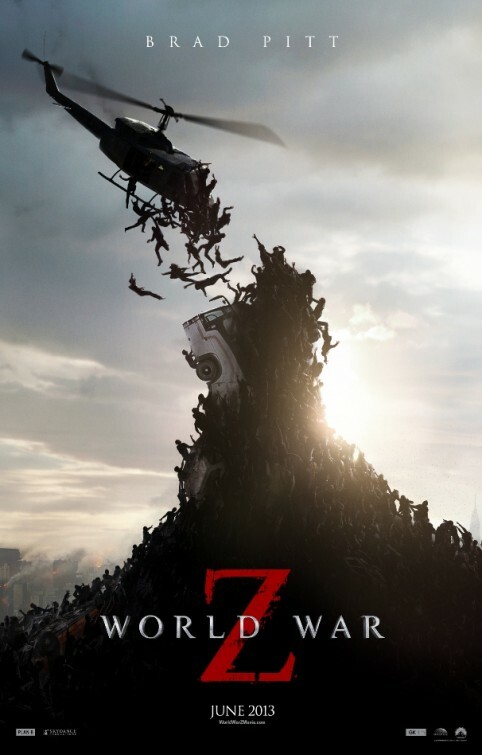 WORLD WAR Z gets a new trailer and 2 new posters – Brad Pitt vs. zombies! Let’s face it, zombies are so hot right now. So the concept of Brad Pitt trying to survive a zombie outbreak sounds like a must-see, right? The Marc Forster (QUANTUM OF SOLACE) film has had its share of problems – rewrites, reshoots, lots of delays. Despite that is seems like audiences are pretty excited about seeing it this summer, and the first trailer was circulated pretty heavily. Even the Super Bowl spot was one of the more talked-about movie previews during the big game. Now you can check out the newest WORLD WAR Z (based on Max Brooks’ best-selling novel) trailer below along with two new posters (one above and one below). Lots of the zombie carnage is similar to what we’ve seen in the other trailers, but the plane sequence is something new. Take a look and tell us your thoughts in the comments. WORLD WAR Z is directed by Marc Forster and stars Brad Pitt, Mireille Enos, Daniella Kertesz, James Badge Dale, Matthew Fox and David Morse.